Just need to wait for some of my clothes to dry to finish packing! Time is flying by like crazy and I’m still in denial that I will be an official college student in less than 24 hours. Actually, Orientation doesn’t begin until this Thursday, but I became part of something called the Bonner program, which admits 12 first-years each year to the civic leadership program. During Monday (tomorrow!) to Wednesday, I will be doing everything you can imagine in the Bonner pre-orientation: moving in, touring the city, filling out student employment forms, going on the Bonner overnight retreat, eating out, and hopefully making some new friends! 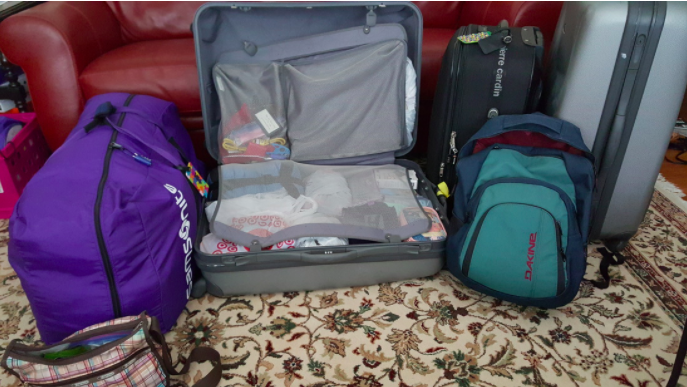 I will be flying to the Twin Cities tomorrow by myself bringing 2 checked bags (the purple duffel and the open suitcase on the left in the photo) first. My mom will join me at Macalester on Thursday with another 2 bags (the 2 upright suitcases on the right) to help with moving in. She’ll be staying at the nearby Holiday Inn for a few days and attend some of the seminars for parents during Orientation. I’m not exactly sure how my schedule will be this upcoming week, so if I do make updates, they might be a collection of photos or short posts. college student. senior. international studies major. over-the-top foodie. aspiring diplomat. Rachel has read 4 books toward her goal of 12 books.